Chief of Staff says Assad will fall and the IDF can take in Alawite refugees to the Golan. A large influx might threaten Israeli control. IDF Chief of Staff Benny Gantz said Tuesday that he expects Syrian President Bashar Assad to lose power and that the IDF is planning to absorb a large influx of Alawite Muslim refugees in the Golan Heights. The Alawites are a minority in Syria but rule the country under Assad, and a full-scale presence in the Golan Heights would threaten the bare Jewish majority in the area. The Druze comprise almost 50 percent of the Golan population, and a larger non-Jewish population could re-ignite attempts by the United States and other Western countries to pressure Israel to give up the strategic area to Syria in return for a peace treaty. "The day the Assad regime falls, this is expected to hurt the Alawite sect. 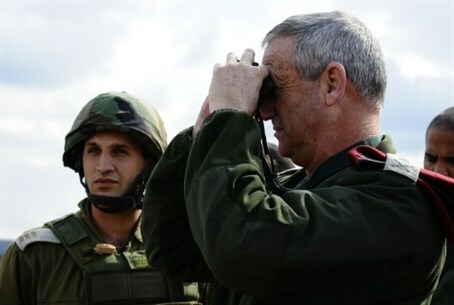 We are getting ready to take in Alawite refugees in the Golan Heights,” Lt. Gen. Gantz told the Knesset Foreign Affairs and Security Committee. Several center-left political leaders in Israel, including Likud Knesset Member Dan Meridor, have backed giving up the Golan Heights for a peace pact. The area has large water resources and is eagerly sought by Assad, whose country has the same water shortage problem as does Israel.